1. You're not really listening actively to the right thing. You must focus your ear primarily on the center of the pitch in the track... and that is usually on some acoustic instrument. Overtones of instruments can distract your ear. Lowering the bass can help you focus on more accurate frequencies (overtones from even an in-tune bass can throw your ear off). If you're having trouble in the studio, taking instruments out of the mix can help... so it's just bare bones acoustic guitar, piano and maybe some drums. Of course, if you can't hear because the band is too loud and/or your stage monitor mix is bad, you'll have to depend on the physical sensation or feeling of being in tune... the muscle memory you learn when you practice being in tune. Cupping your hand or two fingers over your ear helps, and many artists now use ear monitors, but you have to get the mix right. You might want to practice with a gadget called Hearfones. 2. You are holding some sneaky, counter-productive tension somewhere keeping you from accurately aiming at pitch. In this case, you do hear it... you just can't hit it. Discover and cure the tension and your pitch will miraculously improve. A masseuse, chiropractor, Alexandra Technique or Feldenkrais practitioner, or intuitive vocal coach can help you do this. 3. Or, ear training may be something you really need. Target practice is vital: Play a note or series of notes and try to hit them dead on. If you can't tell if you're right, practice with someone who CAN tell (and/or a vocal coach). And don't let yourself get by with the bad habit of singing a little out of tune. 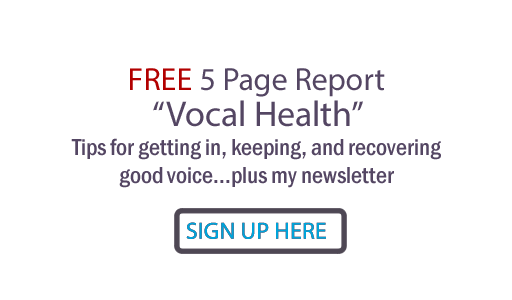 Don't worry about being surgically accurate unless you're a session singer, but DO try to be! And a final point: remember that it's not a good idea to depend on vocal tuning your final vocal to do the job. Yes, tuning can be a helpful tool, but used improperly will take the magic right out of your recording. There is a little company that does very good quality tuning by hand, and doesn't want to bankrupt you like some other services out there. If you want pro quality results on a budget, they can be a good resource. Talking On The Phone Can Hurt Your Voice! How Long Should You Warm Up Before Singing?